This dance was composed by Alison Davey and Kirstie Crewes in 1988 as part of a folk play called “The Hard Rock Miner” which was toured by Cam Kernewek through that summers festival season. This dance is modelled on the Boscastle Breakdowns and the footwork is intended to emulate the noise made by the tin stamps, great Oak beams that were used to crush the ore. This is the sound that would have dominated the lives of the Bal Maidens ( the girls working above ground dressing the ore). Contemporary accounts of the nineteenth century mining industry in the hinterland of Redruth and Camborne describe dramatic scenes of noise and smoke. As well as the Boscastle Breakdowns, the dance draws on steps from Lattapuch, The Four Hand Reel and Mr Martins Reel and in doing so captures most of the principle steps in Cornish Scoot dancing. Formation:Two or more dancers facing each other. Step left foot, hard shuffle right, then right (normally) and shuffle left. 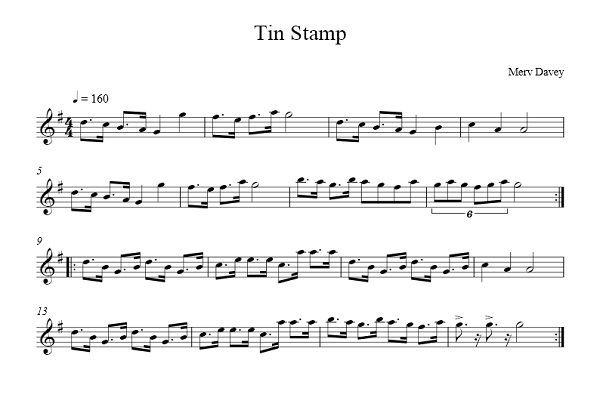 [The step on the left foot is always hard thus producing a sound which imitates the Tin Stamp] Repeat four times ending with two stamps. Repeat bars 17 to 24 but on this occassion the 8th beat is provided by jumping and tapping both feet together in the air.